Ok, so this outfit is the very reason I didn't call this the party dress feature, because today I have a BeBe fave, the jumpsuit! 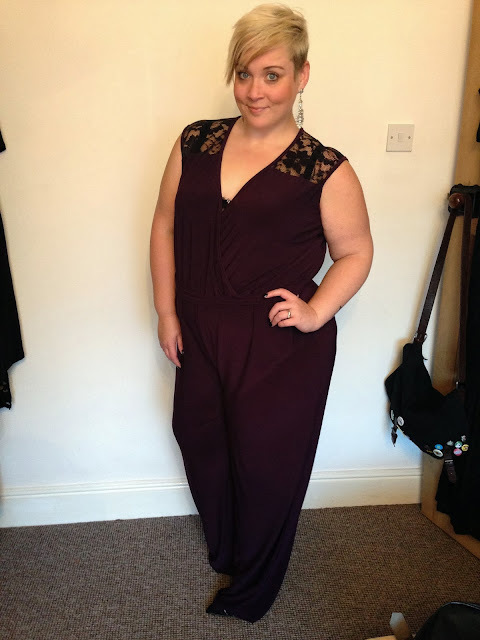 I love jumpsuits, I don't know why, I just do! Let's just get this one out of the way… it is insanely long, so perfect for you tall girls. If you are anything under about 5'10, you will most probably have to have this taken up. Having said that, apart from the length the fit is gorgeous, I'm wearing the 22(UK) and it's true to size. Its not too clingy and looks fab on. My photo's sadly don't do the colour any justice, it's a deep, rich aubergine colour and the lace shoulders are so beautiful. I stumbled across this blog and I just have to say you look absolutely gorgeous!